Microsoft Dynamics NAV, an integrated business management ERP software can be deployed on Microsoft Azure as an Infrastructure as a Service offering. Microsoft Azure IaaS enhances the agility, efficiency and responsiveness of your crucial IT infrastructure by delivering on-demand scaling, optimal price- performance and end-to-end support. With the general availability release of Microsoft Azure Infrastructure as a Service, it is possible to migrate earlier versions of Microsoft Dynamics NAV 2013 R2 and NAV 2013 with Feature Pack 1 include provisioning tools that enable to easily and quickly deploy to the Azure cloud. As a Microsoft Dynamics NAV partner, Sysfore has the experience of having deployed several enterprise line-of-business workloads on Azure IaaS platform. We will help your deployment of Microsoft Dynamics NAV on Microsoft Azure IaaS platform. 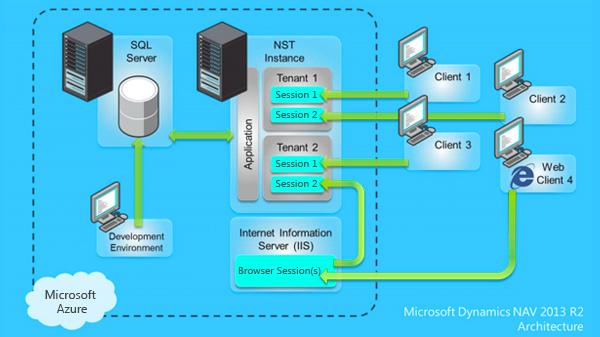 To facilitate better accessibility and availability of critical business data on Microsoft Dynamics NAV, Sysfore collaborated with a Microsoft Dynamics NAV Cloud Consulting Firm to successfully migrate an ERP from an on-premises data center to a Dynamics NAV production environment on Microsoft Azure IaaS. Securely access ERP hosted in the cloud anytime, anywhere even on-the-go, through the Microsoft Dynamics NAV Web client on virtually any device. Deployments support 99.95% up-time SLA. Your Microsoft Azure Dynamics NAV solution will run within secure multi tier data center where information and infrastructure are physically and digitally protected and preserved in the best possible way, with extensive intrusion checks, as well as back-ups made and delivered daily. Easier to deploy new servers or even entire environments quickly on the Microsoft dynamics NAV environment where new Windows Server can be quickly spun in minutes or a Dev Site and Test Site can be set up in a few hours. This reduced time for deployment helps achieve a faster ROI. Eliminates the cost incurred on over-sized on-premises datacenter infrastructure, licenses and IT management. Ability to conserve cash flows by eliminating CAPEX in favor of OPEX. The Microsoft Azure Dynamics NAV cloud Pay-as-you-go (PAYG) subscription model offers flexibility with no upfront costs and no long term commitment. You only pay for the computing resources you use. Microsoft Dynamic NAV azure enables robust security, backup and privacy controls in geographically dispersed datacenters and delivers 24x7 global support from Microsoft.